As we touched on briefly in our step-by-step how to build a horseshoe pit article, rubber horseshoes serve a very practical purpose within the world of horseshoes games: they’re safe and fun for everyone, especially kids! Check out our favorite sets below, and also learn what features to look for when choosing the set for your family. 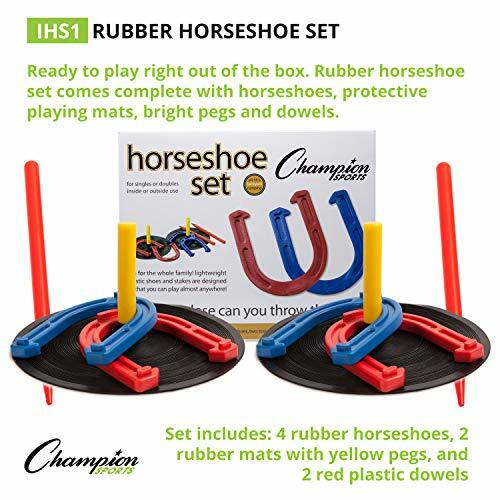 The best rubber horseshoes set, at least in our humble opinion, is this one by Champion Sports. It is designed for all ages and comes with lightweight rubber horseshoes that are easy to throw safely. The soft design of the horseshoes makes this set perfect even for the youngsters, while the standalone stakes cut off the need of a horseshoes pit. What this means is that you can enjoy the game all year long, indoors and outdoors alike. The soft rubber base of the stakes will not ruin your floors, while the lightweight horseshoes will unlikely cause any damage as long as you set the play area in an empty hallway. A feature that doesn’t determine performance but makes the whole game much more enjoyable is the use of bright, vibrant colors for the components. Yellow pegs, alongside red and blue horseshoes, make this set attractive for players of all ages. Like you would expect, the set includes all needed to play straight out of the box, whether you’re planning to start the game in your backyard, living room, or at the camp site. What’s even best, is that your kids will even be able to set this up in their own, so they can have some afternoon fun even if you feel too lazy to help with the setup. If you’re looking for a reliable rubber horseshoes set capable of delivering utmost quality, the Franklin Sports Rubber Horseshoes could be the one you were looking for. This versatile set comprises all you need to play straight out of the box. 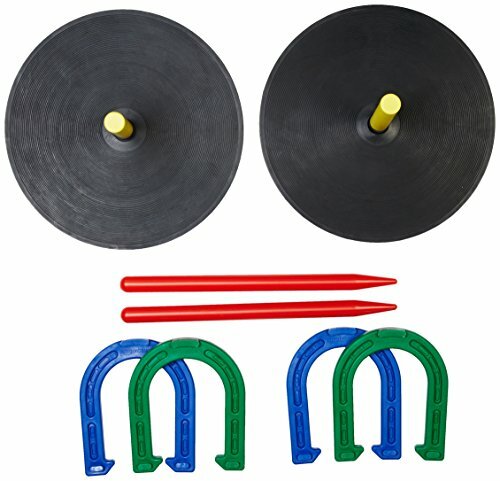 Ideal for kids and adults, as well as indoor and outdoor play, the set includes four soft rubber horseshoes, two green and two blue, two traditional pointed ground stakes for outdoor playing, as well as rubber bases with plastic pegs for indoor fun. The two freestanding targets are also great to use on paved surfaces, such as decking or a paved backyard, especially if you don’t have sufficient space or time to build a horseshoes pit. A choice of vibrant colors makes the set easy to see, a feature particularly useful for kids as it helps them notice when the horseshoes are thrown. Although similar to other rubber sets, what makes Franklin Sports different is careful attention to detail. Each component presents flawless aesthetics, smooth edges and corners, and beautiful decorative elements on both rubber targets and horseshoes. Then, an attractive price point boosts this set’s value, making it a top choice for all leisure horseshoes players. A cheap alternative to our top and best choice picks, the Rubber Horseshoe Set by AmazonBasics includes all needed to play right out of the box, whether indoors or outdoors. Like most rubber horseshoe sets, this one is ideal for players of all ages and boasts an easy set up regardless of where you want to play. Included in the box are two sets of horseshoes of different colors, two rubber mats, as well as rubber mat posts and two ground stakes. This feature allows you to use it either of soft ground or hard pavements. Bright colors promote visibility and make the set perfect for the youngsters, but also for adults with mild visual impairments. Not only the set is easy to set up, but it is also really easy to wipe clean with a damp cloth. Made of rubber, the components are also safe to leave outdoors even when it rains. You won’t have to worry about rust damaging any pieces. The choice of materials also ensures a low weight, a great thing if you want to take the game on camping. Like most AmazonBasics products, this rubber horseshoes set is backed up by a 1-year limited warranty. The SPORT BEATS Rubber Horseshoe Set comes as a great compromise between quality and price. It brings real value for money and combines lightweight components with flawless aesthetics. Like all sets featured above, it comes with all needed to play straight out of the box, either indoors or outdoors. Perhaps the best thing about this set is the choice of colors. Bright and vivid, the manufacturer associated red and blue, two of the most common colors used for recreational lawn game sets. Great to play as single players or in teams, the set is also ideal for both adults and kids. The safe design includes quality lightweight horseshoes that are soft enough to prevent injuries even when used by toddlers. They are easy to throw and aim, while the rubber mats provide sufficient stability to the pegs when playing indoors or on a hard surface. Two ground stakes also allow for a traditional setup of the game. You can use them to play in the backyard or at the camping site. Thanks to the resistance of the material, you can leave the set outside even when it’s raining or under the hot sun. When the time comes to put it aside during winter, you can simply wipe the pieces with a damp cloth to remove dirt and grime. Ideal for most players, the game is backed by a 100% satisfaction guarantee and boasts excellent balance between value and money. If you’re in the market looking for the best horseshoes sets, you might be overwhelmed by the number of options. It’s often hard to decide what makes a worthy set, that’s why you should consider the following things before buying. Undoubtedly, the first thing to decide is whether you want to play horseshoes professionally or just for leisure. It’s easy to find sets for either purpose, but the requirements are slightly different. Sport horseshoe sets: Also known as professional sets are designed for people who want to play by the rule. They usually consist of ground stakes and horseshoes made of steel, a material that offers sufficient heft as well as resistance. These sets are designed to be set up in an “ideal” environment. You’ll need sufficient space to build a horseshoes pit and set a throwing line as instructed by the guidebooks. While these sets are a must for players who aim for performance, they are rather expensive and often impractical to use for recreational purposes. Recreational horseshoe sets: Can also be made of steel, although rubber horseshoes sets are a much more popular option. Most rubber sets on the market are designed for flexible indoor and outdoor playing. They have both ground stakes and rubber mats with pegs that allow for easy setup in any location. Because rubber is lightweight and non-hazardous, these sets are also ideal for players of all ages. Perhaps you already decided whether you want a professional or recreational set, but a thing to consider nonetheless is the space you have. Steel sets are ideal for those with a medium to large backyard and who’s not planning to play indoors. You will need room for building the pit, as well as for leaving enough space between the pit and the toss line. Rubber sets are much more suitable for homeowners who’re short on space. Due to their flexible setup options, you can mount the stakes/pegs either in soft ground or on a hard surface, including paved walkways, patios, and decks. If you don’t have a backyard at all but still want to enjoy horseshoes fun, a rubber set will give you the possibility to play inside. Although most sets feature horseshoes made of steel or rubber, these are not your only options. Here are the most common materials you can find, as well as their pros and cons. Steel: Is undoubtedly the “crème de la crème” when it comes to horseshoes. All professional horseshoes are made of steel, due to the durability of the material. Steel also has character, it resists rust, and presents an overall flawless aesthetics. Obviously, all these pros come at a hefty price. Cast iron: Is cheaper than steel and still durable. Cast iron horseshoes offer more or less the same experience as the steel ones, although they don’t hold up quite as well as their fancier counterpart. Although inexpensive compared to steel, cast iron horseshoes are known for splitting at the most inopportune moments. Rubber: Perhaps the most popular option for recreational horseshoes. Rubber is virtually an indestructible material, and although not as noble as steel, it’s family friendly. It also has an impressive performance, allowing players from all walks of life to enjoy a good horseshoes game at a fraction of the steel’s price. Plastic: The lowest-end horseshoes are those made of plastic. This choice is ideal if you only want to enjoy a quick game while camping and are really on a tight budget, but don’t expect any durability, nor the feel offered by all other materials. Nevertheless, plastic is also a family-friendly material, and it’s also suitable to use indoors. If you have small kids who’re prone to destroy things, perhaps a plastic set is the best to start with. Two rubber mats with pegs. Besides these basic components, consider if a carry bag is important to you and choose accordingly. 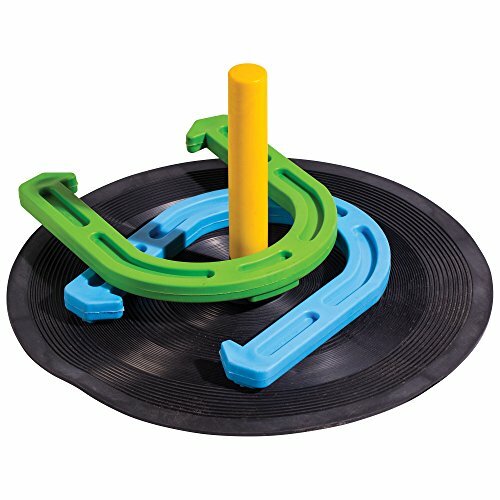 All rubber horseshoes sets that have made it to our list comprise all needed to play straight out of the box. Last but not least, decide on a budget and stick to it. Most recreational sets are quite inexpensive, so you’ll be able to find the right one for you without issues. Since price won’t be a problem, the best thing to do to make sure you’ll get a set that’ll live up to the expectations is to check the quality of the pieces and the finish touches, to ensure they are flawless. We chose to look at sets that we felt covered off these bases and provided a simple and easy solution to having a fun time. All four of the sets provide fun indoor and outdoor options. Playing horseshoes is all fun and games until a heavy horseshoe injures your kid. To avoid disaster and enjoy this lawn game in all safety when the little ones are involved, you need the best rubber horseshoes set. We’ve roamed the market, tested, and rated the most promising rubber horseshoes sets for you in this article. We chose to look at rubber because we wanted a set that was safe for families and houses. While a professional set can be a ball, those ‘shoes can often get thrown in directions we never thought possible. Kids can get a little rambunctious from time to time so having a set that won’t hurt anyone or blow through any windows makes sense for a lot of people. If you’re an occasional player looking for the right set to enjoy horseshoes on a summer afternoon, those made of rubber come with clear advantages over their professional counterparts. 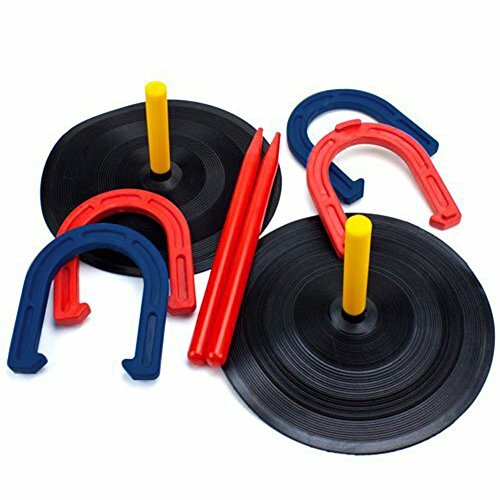 Rubber horseshoes sets are ideal for players of all ages, and let you enjoy the game in all seasons, either outdoors or indoors. Rubber horseshoes are also cheaper than professional sets, lighter, and easier to install. Perfect for small backyards, they come with both stakes and rubber mats and pegs, allowing for a flexible setup. If you’re convinced a rubber set is what you need, you now even know which are some of your best options, so that you can enjoy this lawn game whenever and wherever you want. While they may not serve the purist and the competitive player, rubber horseshoes are a great alternative for those looking to play recreationally and involve everyone around in a fun game.